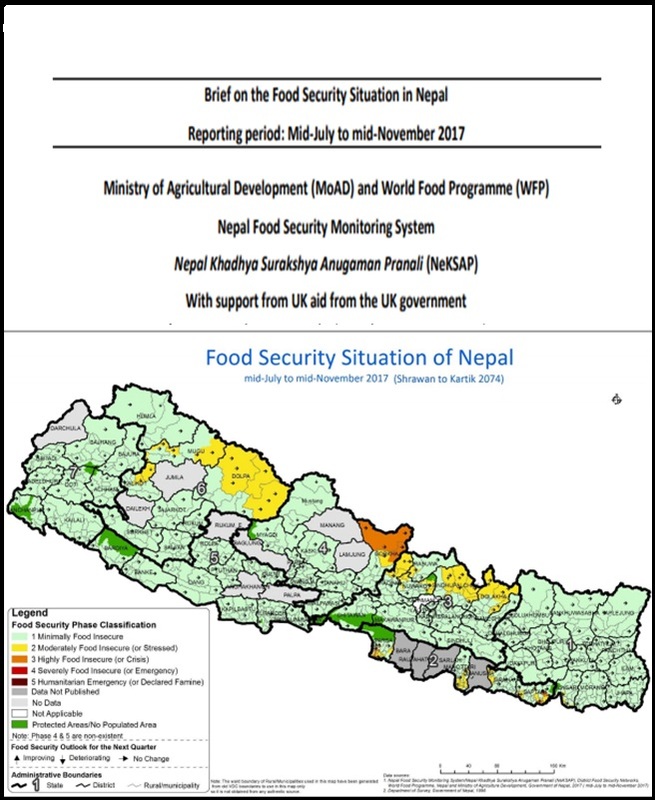 This brief on the Food Security Situation in Nepal (Mid-July to mid-November 2017) includes the results of NeKSAP Technical Working Group (TWG) and/or District Food Security Network (DFSN) meetings held in different districts across Nepal in December 2017. These meetings analyzed the food security situation during the period of mid-July to mid-November 2017 (Nepali months of Shrawan to Kartik 2074) and following the restructured district and local government arrangements. Hence, unit of analysis is taken as Ward as opposed to Village Development Committee (VDC) in the past. It is reported that some districts could not organize meetings lack of resources (including the human resources) as the trimester meeting coincided with busy time of federal and provincial level elections. This brief includes data for 63 of the 77 districts. We will release Nepali version of this brief sooner.